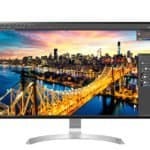 The LG 23EA53V-P may be a few years behind its successors in terms of convenient features and gimmicks, but when it comes to the image quality and the elegance of design, it’s right on par with the latest LG budget series monitors. Although this beauty can be hard to find on the market nowadays, those who possess it should surely cherish it and enjoy its crisp resolution and vibrant image quality. The LG 23EA53V features an IPS panel which delivers vibrant, consistent, and accurate colors which make the crisp Full HD resolution image overflow with details. Additionally, the panel ensures the impeccable 178-degree viewing angles for perfect viewing experience at any angle since there’s no shifting of the colors. In gaming, the performance is smooth due to the quick response time which eliminates visible ghosting of the fast moving objects unless you’re a professional player playing top-tier FPS games. The monitor is Energy Star qualified which ensures power efficiency since the power consumption is reduced by 30% than the usual monitors and amounts to 26W maximum and 0.3W in the standby mode. You can also make use of the Super Energy Saving function which provides optimal brightness to save on power and can automatically turn off the monitor. Whether you’ll be using the monitor for gaming, watching movies, or just internet surfing, you can easily suit the desirable image settings via the pre-calibrated image presets. These presets include Text, Photo, Cinema, Game, and the Standard configurable mode. All of these presets use optimal parameters of settings such as brightness, sharpness, colors, and the dynamic contrast ratio of 5M:1 for the best viewing experience depending on the activity you’re watching on the screen. You can either select these presets in the OSD menu, or by the third OSD button at the bottom bezel of the LG 23EA53V. Unlike the newer versions of this LG monitor, the LG 23EA53V doesn’t have the OSD joystick but rather regular buttons. We got a little spoiled by the convenience of the joystick, but the OSD buttons on the LG 23EA53V still provide an easily navigatable adjusting in the user-friendly menu. Moreover, there are more buttons which means more shortcut options, such as the “My Key” button, “Function” hotkey, auto-adjustment (VGA only), and input source selection. The “My Key” button opens up an extra shortcut menu in which you can assign additional shortcuts while the function button allows you to quickly swap between the picture presets, disable/enable super energy saving, and activate the Dual Display and Dual Web features. Once you install the Dual Smart Solution software which comes on the CD, you will be able to use the two mentioned features. The Dual Web feature allows you to split your screen into two, allowing you to surf the web, among other things, more efficiently. The Dual Display feature is useful when you have an additional monitor connected to the PC as it allows you to adjust settings related to dual monitor setups. Other picture and color settings include the standard adjustable parameters such as brightness, contrast, sharpness, gamma, and color temperature including a mode with configurable red, green, and blue color levels. Additionally, you can adjust a feature deemed as ‘black level’ which increases visibility in the dark scenes, and the ‘overscan’ which can increase clarity and stability of the image. 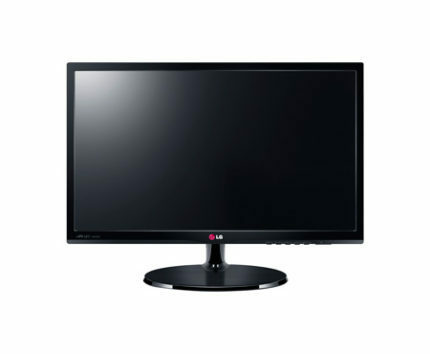 The LG 23EA53V features a glossy black cabinet and a slim design. The screen of the monitor is covered with a hard 3H coating which eliminates the sunlight reflection. You can tilt the screen of the monitor by -5, 20 degrees and VESA mount it on the wall with 75 x 75mm holes pattern. However, the monitor is not height adjustable nor can you pivot or rotate it. 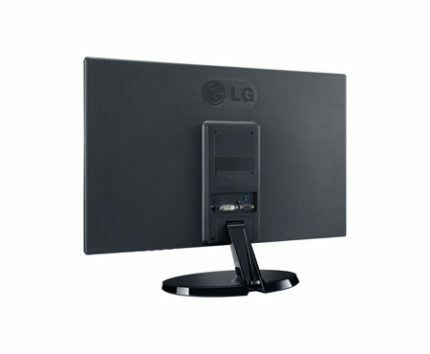 The LG 23EA53V provides plenty of connectivity options including one of each VGA, DVI, and an HDMI port. Additionally, there’s an audio port which can be used for external speakers or the headsets. All of the ports are placed at the back of the monitor and face upwards for more practical and easier connecting of cables which can also be concealed and neatly routed through the hole for cables placed at the bottom of the pedestal. 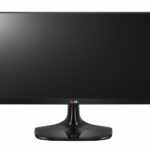 The LG 23EA53V provides its viewers with a stunning image quality, highly responsive performance, and a crisp Full HD 1080p resolution even though it’s a slightly outdated monitor. 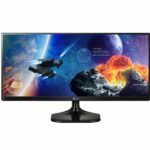 If you happen to come across this monitor, seize the opportunity and take one as it covers all the requirements for a pleasurable viewing experience no matter whether you’ll be using it for gaming, watching movies, or any other multimedia activity. Regardless of its outdated OSD menu, it still offers more configurable settings and easier navigation than the most modern monitors today; not to mention the sleek design which with all its simplicity surpasses the appearance of much more expensive monitors. The LG 23EA53V offers a vibrant image quality, crisp resolution, quick response time, and the impeccable viewing angles thanks to its IPS panel. Moreover, it features plenty of connectivity options, a slim design, and some unique features including screen split and pre-calibrated picture presets.